Is It Better For Gay Politicians to Come Out of the Closet? A recent political science study in Ohio has shown something that even 10 years ago was seen as unimaginable or even “committing political suicide”. Incredibly, a study from the University of Cincinnati has shown that sexual orientation may no longer hurt candidates aiming to win public office, and might even help some candidates win. For context, most political advisors advise LGBT candidates who run for public office that they will have to overcome and downplay the fact that they are LGBT. While there are caveats to this research, if this trend continues to emerge in American politics as time goes on, it could change the way voters look at their candidates for office. The recent study was undertaken by David Niven, an assistant professor of political science at UC. Niven decided to conduct the study with a legitimate race for public office. 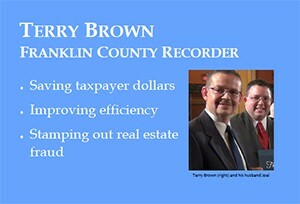 He was lucky to find a Democratic primary for Franklin County, OH recorder, a county that includes part of Columbus. In the race, the incumbent was an openly gay man named Terry Brown and a challenger, Danny O’Connor who is straight. This presents one of the big caveats to the race. Both men were Democrats, a party that LGBT voters clearly favor in higher numbers than they do for Republicans. When conducting the study, Niven chose 30 different precincts to conduct the study on, according to the article. In half of the precincts, three different mailings were sent to households. One included only the candidate, while the other two included a photo of him and his partner. Photos of each mailing are copied below. In the other 15 precincts, no mail was sent at all, so those precincts were the control group for the study. It should also be noted that only houses with a registered Democrat in residence were included. A photo of the first mailing, showing only the candidate. A photo of the second mailing, showing the candidate and his partner. A photo of the third mailing, showing the candidate and partner, but also affirming his support for marriage equality. In the end, Brown, the gay candidate, lost to O’Connor, but Niven, in charge of the study, claims that it was not because of sexual orientation. 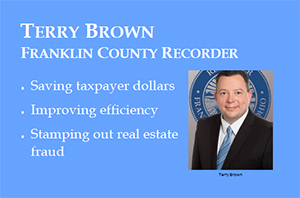 Here’s why: according to the article, Brown actually received less votes from people who received the first mailing, with just a picture of him, than people who did not receive any mail. Also according to the study, the numbers between voters who received a mailing of Brown and his husband were very comprable to those of the control group, who received no mail at all. The most interesting revelation from this study is how voters who received only the third mailing, which shows Brown’s husband and lists in a bullet how committed to marriage equality they are, actually received 4% more votes than any other mailing or the control. While these are only numbers from one race, 4% is enough votes in a close race to swing voters in either direction. While there are many caveats to this study, the progress it shows in the American electorate could be staggering someday. It represents a major change in behavior that people will even consider, let alone vote, for an LGBT candidate for office, something unheard-of until the last decade or so. Obviously, this was one study done with only voters of one party, but it could show early signs of change that would impact American politics as a whole. It’s interesting that a politician would volunteer to do this interesting study. It’s also interesting how focused American’s are on the religious beliefs of a candidate. Most candidates are openly very Christian, speak highly of God, talk commonly of their faith. Anyway, I think your post speaks to the wider idea that either the values of the average American are changing, or we are no longer bothered by sexual orientation when considering who to vote for and may instead focus on their platform, policies, and experience. But, thats probably just wishful thinking.